When you write in plain English, you are not “dumbing it down”. You are clearing things up. There are two main ways to make a text easier for everybody to read. One way is to use simpler concepts. This way, even people with little education will understand. Even people unfamiliar with the topic will understand. For instance, try explaining climate change to someone with very little education. You could talk about the change in temperature and the melting ice caps and the rising oceans and how all this affects El Niño and… no way! You’ll have to make the explanation itself simpler. Should you dumb it down? We’re putting things in the air that don’t belong. It’s messing up the weather patterns. We’ll have more tornadoes and more droughts that hurt the crops, so the price of food is going to rise. That’s dumbing down. You’ll note that the words aren’t all that much simpler. It’s the ideas that I’ve simplified. Sometimes you need to dumb things down, so that everybody can understand. But sometimes you don’t want to dumb it down. Sometimes you want to explain things in detail…but you still want people to understand. To be clear, you might need to use many 50 dollar words. For instance, with climate change, you might have to use words like “anthropogenic” and “per capita emissions”. Or you might be comparing the findings of several scientific reports with long-winded names. And they might be published by bodies with equally long-winded names, such as the International Conference for Latitudinal Investigation of Sesquipedialian Anthologies. Not much you can do about scientific terms or official names. Sometimes, you can avoid some of these big words. But it’s not worth doing if your message becomes less clear. So use big words when you need to. But that makes your text hard for even rocket scientists and climatologists to read. Yes, they are educated. Yes they can understand the big ideas. And with effort, they can wade through the big words, too. But no amount of education makes it easy to read long sentences stuffed with long words. So what should you do? Leave the big words that clarify your message. Use shorter, simpler words where they don’t reduce clarity. 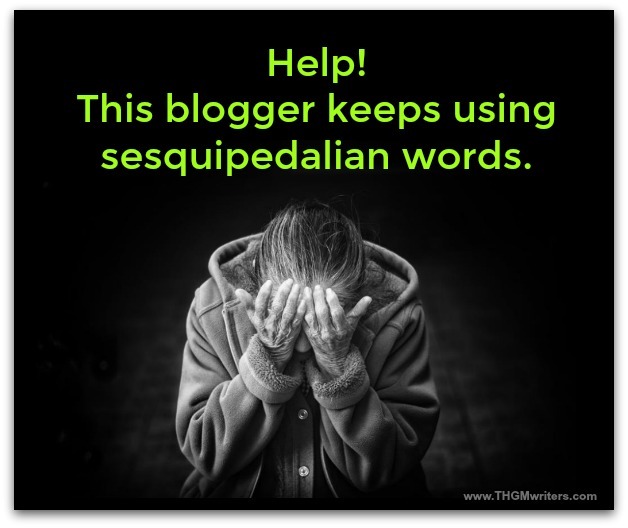 In fact, the more sesquipedalian words (ooh, I love that tongue-twister!) in a sentence, the more important it is to use simple words around them. That’s not dumbing it down. That’s clearing it up. Use simple words around the big words. That’s not ‘dumbing it down’. It’s clearing it up. FACT: It’s easier to read the big words, when there are smaller words around them. We write for you in plain English. We make it easy to read, but we do not dumb it down. Earlier, I wrote about 14 words to ditch, because you just don’t need them. Now let’s look at 33 words that you can almost always replace with simpler, more common words. Write “real” or “true”, not “veritable”. Write “big” or “large”, not “sizable”. Write “need”, not “require” or “requirement” or “necessitate” or “nessessity”. Write “must”, not “are required to”. Write “book” or “magazine”, not “publication”. Write “set up”, not “establish” or “install”. Write “study” or “review”, not “investigate”. Write “now”, not “currently” or “currently existing”. Actually, this can usually be removed. If you write in the present tense, it is now. Unless there is a reason that readers might think it is some other time than now, leave the word out. Write “give” or “leave” or “place”, not “provide”. Write “help”, not “assist” or “assistance” or “facilitate”. Write “show”, not “demonstrate” or “indicate” or “manifest”. Write “to”, not “in order to” or “in an effort to”. Write “has” or “includes”, not “is composed of”. Write “when”, not “at the time when”. Write “called” or “named”, not “entitled”. Sometimes, you can skip this word altogether. Write “can”, not “is able to” or “has the capacity to” or “is capable of”. Write “company” or “business” or “venture” or best of all “firm”, not “corporation” or “enterprise”. Write “many” or “lots of”, not “a large number of”. Write “project” or “program” or “plan”, not “initiative”. Write “group” when possible, not “organization” or “association”. Write “hard”, not “difficult”, except when the meaning of hard might be confusing. Write “terms” or “language”, not “terminology”. Write “car” or “truck”, not “vehicle”. Those are just a few examples. Give me enough time, and I’ll create a whole new form of Thesaurus. How come I missed this? Or I think I commented? Anyways, a second read I suppose made me pick a lot of needed things (words) for a writer.